The US Navy warship USS Ross’s port of call in Ashdod is a clear signal that Washington backs Israel’s military efforts to prevent Iranian intervention in Syria, Prime Minister Benjamin Netanyahu said on Thursday, broadly hinting that this was a message to Russia as well. 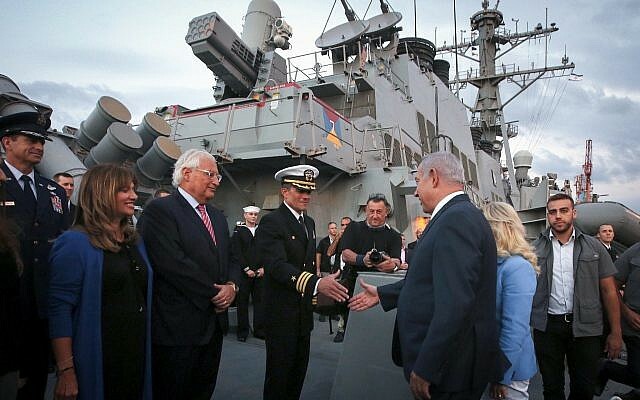 “This is the first visit in some 19 years by an American destroyer at the Ashdod port,” Netanyahu said as he toured the ship with his wife, Sara. “There is significance to this visit; it symbolizes that deep alliance between Israel and the United States.”Noting that the USS Ross is in action against terror objectives in Syria, Netanyahu said the Israel-US alliance is close across many spheres, but especially when it comes to security. “We are determined to act to defend ourselves against the Iranian military entrenchment in Syria, and against its proxies,” he said, referring to Hezbollah. Netanyahu’s comments come against the background of the crisis in Israeli-Russian ties following the September Syrian downing of a Russian plane, which Moscow indirectly blamed on Israel and – as a result – sent S-300 advanced anti-aircraft missile batteries to Syria. “We want them to go back to Iran – get out of Syria, get out of Yemen, get out of Iraq, and stop building war and creating misery everywhere they go,” he said US Ambassador David Friedman, who was accompanied by his wife, Tammy, said the symbolism of the moment should not be lost on anyone. The USS Ross is a US Navy guided-missile destroyer. Though it anchored in Haifa last year, this is its first visit to the Ashdod port since 1999. “The return of American naval vessels to Ashdod reflects the depth of Israeli-US relations,” said Port Director Orna Bikhor. The Arleigh Burke-class destroyer carries a crew of 400. During their stay, crew members will visit several local sites in Ashdod and participate in activities with residents. The USS Ross is currently operating in the Navy’s 6th Fleet area of operations, which covers about half of the Atlantic Ocean, from the North Pole to Antarctica, as well as the Adriatic, Baltic, Barents, Black, Caspian, Mediterranean and North seas. It is fitted with surface-to-air missiles, Harpoon anti-ship missiles, Tomahawk cruise missiles, anti-submarine rockets, torpedoes, Phalanx Close-In weapons systems, and a five-inch rapid-fire deck gun. Last April, the ship fired Tomahawk cruise missiles at the Shayrat Airbase in Syria after a chemical weapons attack on Khan Shaykhun by Bashar Assad. The regime’s attack killed close to 100 people. Some have expressed concern that port calls by US naval vessels – both to Haifa and Ashdod – will be discontinued due to US intelligence concerns when Israel follows through with its plan to hand over the running of the Haifa Port to a Chinese firm in 2021, and allows a Chinese company to build a new port in Ashdod.